Stila has finally launched the Magnificent Metals Shimmer & Glow Liquid Eye Shadows and I for one am very excited to try one of these after trying out the glitter versions and being so impressed. The swatches of these look insane, I think I want to get my hands on Kitten first. This product is available in 11 shades. Pixi has launched some gorgeous new products and the one that has really caught my attention is the Eye Reflection Palette. It's packed full of warm tones! Kat Von D has launched a bunch of new products at Debenhams this month including the Mini Metal Matte Eyeshadow Palette and the Basketcase Eyeliner that is in collaboration with Billie Joe Armstrong. Not that I actually need any more eyeshadow palettes but I really want to get my hands on this new launch from Kat Von D. I have been really impressed with the highlighting palette I tried from her brand recently so I really want to see how the eyeshadows compare! Urban Decay has launched a couple of new products this month, the first is the Drop Shot which is a mix in oil that can be used to mix into foundations. Another new launch from the brand is the Kristen Leanne collection, I love the packaging of these products! The one item that has really caught my eye is the Beauty Beam Highlight Palette - you know me, I love highlighters! Speaking of highlighters, Too Faced have come out with the Diamond Light Highlight which I have and I can't wait to have my review up in a couple of days. There are a lot of new launches on the high street too! The first is the Makeup Revolution Conceal and Define Concealer which is said to be very similar to Tarte's Shape Tape. Then there is the new Real Techniques Blend + Blur Brushes which I do really want to try out soon as I love Real Techniques! There are a few different sizes available and they are currently on offer at Boots too. 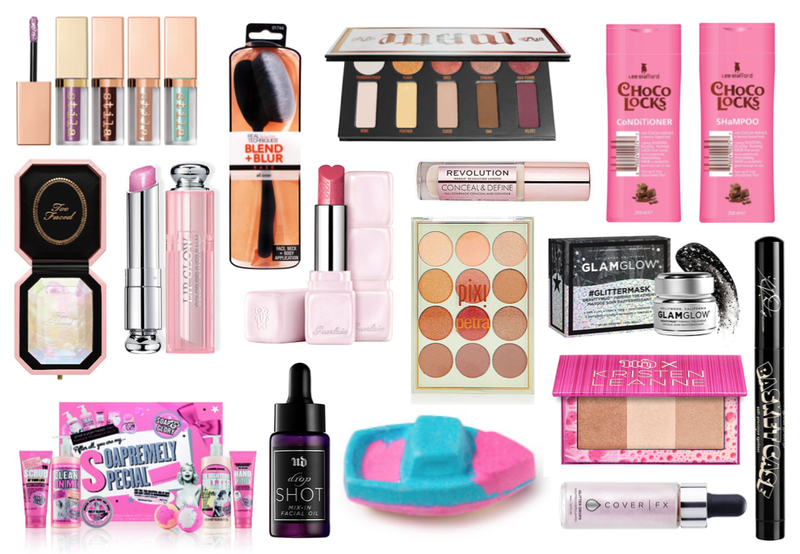 Speaking of offers at Boots... there is one amazing Soap & Glory deal at Boots at the moment! The Soapremely Special Set is on offer for £20 and comes with so many products! You get the new bath bombs in this as well as the cult classics from the brand. Speaking of bath bombs, LUSH has just launched the Valentine's Day collection for this year and I can't wait to get my hands on a few things! I'm so happy they brought back the Unicorn Horn too. I love Lee Stafford hair care products and I spotted the new Choco Locks range on the Boots website and I need it in my life! Shampoo that smells like chocolate?! Yes please! There are also two glitter products that launched this month, the first is the Cover FX Glitter Drops, I have heard such good things about this brand that I would love to try them out this year. Another brand that has launched a glitter product is GlamGlow with the #Glittermask Gravitymud. I'm sure putting that much glitter on your face can't be beneficial but it does look pretty!